We offer you many different types of tabletop scale such as a scale with electronic platform, a scale for recipes, a counting scale and a laboratory scale. The tabletop scale covers different professional segments and can be used in many different fields. You can also order additional devices: external printers, devices to measure from below, tripods and systems for measuring density. For models of tabletop scale with an RS-232 interface there is software available to transfer data to a computer for working online. Our bestselling Tabletop Scale PCE-BS Series is a light, rugged precision balance suitable for different purposes. The removable stainless steel pan allows the tabletop scale to be cleaned easily. PCE-PB 60N is a multipurpose industrial tabletop scale with ZERO, TARE and part counting (PCS) functionality. This heavy-duty digital balance features a removable stainless steel pan for easy cleaning. The scale weighs units in either grams (g), kilograms (kg), pounds (lb) or Newtons (N), and is powered by battery or AC power. Ideal for shipping, receiving, manufacturing and general purpose use, this versatile scale has a large LCD for easy viewing, simple 4-button operation and a USB interface for connecting to a PC. PCE-PB 150N is a multipurpose tabletop platform scale. This heavy-duty digital balance features a removable stainless steel pan for easy cleaning. The scale weighs units in either grams (g), kilograms (kg), pounds (lb) or Newtons (N), and is powered by battery or AC power. Ideal for shipping, receiving, manufacturing, industrial and general purpose use, this versatile scale has a large LCD for easy viewing, simple 4-button operation and a USB interface for connecting to a PC. The Tabletop Scale PCE-BS 6000 is a light, rugged precision balance suitable for different purposes. The removable stainless steel pan allows the laboratory balance to be cleaned easily. The Tabletop Scale PCE-BS 6000 can be used for weighing as well as for piece counting. The Tabletop Scale PCE-BS 3000 is a light, rugged precision balance suitable for different purposes. The removable stainless steel pan allows the laboratory balance to be cleaned easily. The Tabletop Scale PCE-BS 3000 can be used for weighing as well as for piece counting. The Tabletop Scale PCE-BS 300 is a light, rugged precision balance suitable for different purposes. The removable stainless steel pan allows the laboratory balance to be cleaned easily. The Tabletop Scale PCE-BS 300 can be used for weighing as well as for piece counting. PCE-WS 30 is an accurate and affordable digital tabletop scale. Featuring adjustable feet and a built-in water bubble level, this benchtop electronic balance ensures precision with a full 100% tare weight range. PCE-WS 30 has a compact design and can be powered by the electric power adapter or the internal battery, making the scale portable when necessary. 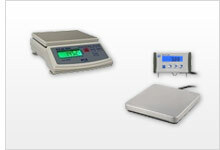 PCE-PCS 30 is a tabletop scale or balance with accurate weighing and piece or part counting functions. Ideal for use in laboratory, office, inventory and miscellaneous industrial applications, this portable scale can be powered by battery or by the included electric power supply. The scale's built-in RS-232 port enables data transfer and printing. PCE-PCS 6 is a tabletop scale or balance with accurate weighing and piece or part counting functions. Ideal for use in laboratory, office, inventory and miscellaneous industrial applications, this portable scale can be powered by battery or by the included electric power supply. The scale's built-in RS-232 port enables data transfer and printing. KB 1200-2N is a digital tabletop laboratory balance or scale offering a high level of precision as well as features such as percentage determination, GLP record keeping, recipe, piece counting, pre-tare, suspended weighing (hook not included) and vibration-free animal weighing functions. Complete with freely programmable weighing units (e.g., direct display of thread length (g/m), paper weight (g/m2), etc. ), this laboratory balance supports a wide range of applications in pharmaceutical, dental, food, veterinary, jewelry, textile and printing industries and beyond. Affordable Tabletop Scale. It can be calibrated with (200 g), weighing units can also be selected, with piece counting function. Affordable Tabletop Scale. It can be calibrated (2100 g), weighing units can also be selected, with piece counting function. The basis weight Tabletop Scale directly shows the result in g/m² with high resolution (0.1 g/m²) / the weighing unit can be changed to grams by pushing one button only. Verifiable waterproof tabletop scale in stainless steel with separate indicator (no corrosion). The multifunctional scale is manufactured to IP67, dust-tight and thus can also be temporarily submerged completely under water (up to 1 m depth). Tabletop Scale with high resolution (0.0001 g), RS-232-interface and optional software-kit / with weighing ranges of 0 ... 100 g.
Tabletop Scale with high resolution (0.0001 g), RS-232-interface. The tabletop scale PCE-IS01 is a professional system for counting, and consists of a quantity and a reference scale. The reference scale takes on the smallest components while the balance calculates the number of pieces. This tabletop scale is particularly well suited for inventories.